In 1951 Kenneth Martin wrote: ‘The square, the circle, the triangle, etc., are primary elements in the vocabulary of form, not ends in themselves. In a rigorous form of art which uses as figures such formal elements, a complete pictorial expression can be achieved.’ Or would you say that your starting point is inspired, more directly, by existing man-made architecture or structures in nature – your observations of the real world? Emma Biggs and Matthew Collings: If Kenneth Martin meant geometry is the vehicle, then we agree. For us, the grid is the thing by which we limit our visual enquiry so there’s a chance of finding something out. It’s the visually neutral basis from which we create many patterns or configurations. These are all simultaneously present in the one object. But only one is seeable at a time. We try to create multiple visual orders. The grid isn’t really anything, but bringing out multiple visual rhythms is important, and producing patterns that constantly change. Our paintings are not immutable statements. First, a pattern seems to be put together in a certain way, and then another configuration appears, then another, and so on. We don’t take on a vast field of enquiry. We don’t feel we could discover anything substantial with too broad a scope, so we’ve decided on a narrow focus. Every painting is a proposal. We ask ‘Is this true?’ ‘Does this seem accurate?’ Sometimes we discover the answer is no, but sometimes, the limitations produce something really surprising, and we think, new. Turps Banana: Sometimes your paintings feel like they are sections of a bigger picture and in my mind’s eye they could carry on and on into infinity. However, almost at the same time, the edges or the ‘frame’ of the canvas seem extremely important and ‘hold’ the arrangement or image in place. 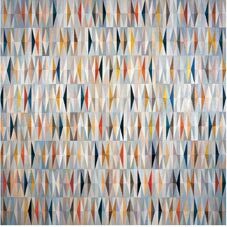 Mondrian’s paintings more obviously alternated between both visual ideas, as Rosalind Krauss highlighted in her famous essay Grids. Which way would you like the viewer to read/think about your paintings? Emma Biggs and Matthew Collings: However they like. But we hope they will be attracted to them in the first place, and then see in them whatever is more complex and involved than mere attractiveness. We would say if our paintings ever feel like sections of a bigger picture they are not working quite right. Turps Banana: Just to continue with ideas about structure, form and space, also perhaps measurement, would you say that part of the process is an investigation into the ‘rational’ or the ‘logical’? I know that many painters find these notions tedious and restricting. Emma Biggs and Matthew Collings: Cultural experience thought to be rational or logical, the music of Bach, for example is described that way as if the description ruled out some aspects of experience. People often confuse an overt visual system, which is what we use, with logic or rationality. We think we are attempting to focus attention on something that subject matter disguises. We saw Peter Doig’s show the other day, and we were struck by how systematised the paintings were, almost musical in their repeats and replaying of elements in a way we thought was great. But if it’s a horizon balancing a diving board, balancing a swimming pool edge, balancing a tree trunk, then what would otherwise be described as ‘logic’ and ‘reason’ is disguised. Going back to that idea of stripping things away, we feel we have stripped away the diving board and are focusing on the structure, to see what’s there without being befuddled by figurative associations. We don’t know the answer already. It wouldn’t feel worthwhile doing it if we did. Emma Biggs and Matthew Collings: Each of us works intuitively. We never draw up charts or plans – the subtlety of the differences we work with would make it impossible. It’s a direct process. Collings paints; Biggs creates the colours, decides where to put them, and how to amend them. The discourse of ‘medium specificity’ is an intellectual talking shop full of ingenious possibilities. Somewhere in it is an idea about time as material. This has tangibility for us as we struggle with colour-leads we’ve set up but not yet adequately followed through. Biggs does all the colour idea work, and she agrees with Albers that experience is the basis, not theory. Turps Banana: Artists such as Jean Spencer took a systematic approach to colour. I am always in a dilemma about how to work this out myself – how far to pin it down. Can it be stressful making decisions about colour and its placement? Emma Biggs and Matthew Collings: Yes, definitely. If there isn’t any stress, there’s likely to be a danger of falling back on familiar tropes. As far as the collaboration is concerned though, Collings gets very anxious if there is anxiety around, and so Biggs tries as much as she can to keep her stress to herself. Turps Banana: However, to follow on from this, to me your paintings seem to be enthusiastic and excited about colour and it seems to be much more than a means to an end. Would you agree with this and is it possible to say something about the status of colour in art/painting? Emma Biggs and Matthew Collings: Colour is vital. Our paintings throw down the glove to what’s going on now. They are not nihilistic. They are not ironic. They can’t be read as an expression of de-materialised, post- industrial production. They start from a conceptual basis, two people from diverse fields turn over and look at lost knowledge, a lost interest – colour. It used to be part of what an artist knew. It doesn’t have to be anymore. Is that a by-product of alienation and atomisation, or the radical overturning of an exclusive field of knowledge? We think it’s the former. And our work, via a tortuously complex procedure of balancing and harmonizing, sets out the terms of this visual argument. Turps Banana: Furthermore, why paint on canvas? Many artists today insist that they can move from one medium to another depending on the concepts or intentions of the artwork in question. And, would you ever use assistants? 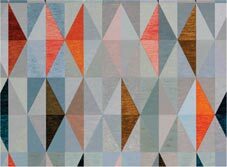 Emma Biggs and Matthew Collings: We’re not sentimentally attached to paint and canvas, we could work in any medium; Biggs is actually a professional mosaicist. We’ve learned how to do what we do together using those materials, that’s all. On the other hand, we try to create an intense visual effect through colour, one that might be capable of being read slightly differently every time you return to it. That is, it should be capable of endless reinterpretation, like art from the past. And for that we feel the means we use at the moment are sufficient. As for assistants, no it wouldn’t be helpful. Turps Banana: And I think you have said that the brush mark or evidence of the human hand, the ‘facture’ in the painting, together with variations in the translucency of paint are important aspects of the work. Can you explain why? 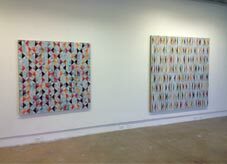 Emma Biggs and Matthew Collings: The handling animates the chosen colour in a certain way. The next colour decision has to respond to that particular colour-texture. Turps Banana: Perhaps these aspects have something to do with the paintings’ aspirations to serve as a metaphor for light. Is this correct? Emma Biggs and Matthew Collings: We think of colour as light and light as colour. Our paintings’ relationship to light is all in the colour. Colour, as David Batchelor’s excellent book, Chromophobia, makes clear, has long been assumed to be somehow feminine, as in secondary or weak. In looking at how our painting partnership is structured, you could easily think it’s rather traditional, in that the woman does the colour and the man does the painterly animation of form. We find it curious that in contemporary art’s examination of the overlooked and the unseen, which we hear about all the time, that the means by which people perceive objects around them is so unexamined, so taken for granted, considered so uninteresting. We assume it’s partly that colour is so difficult to pin down and it means different things to people. Many excellent artists have zero interest in it. Picasso probably didn’t think about it much. And if you tried to talk about it to most contemporary artists they would fall asleep, and if they think about it at all, it’s in the most general of terms. Bright colour is often thought to be sweet or attractive, or easy for example. Or colour is used as something that defines the difference between one area and another: it’s definitional. Print colour influences so much of how colour is used in the art world. It comes partly from the fact that the content of so much art is the mediated object, so print colour and film colour inevitably dominate other forms. Plus no one is supposed to get too hung up on the means by which the message is delivered – so in our case we’ve made the means (that is colour itself) the message. Turps Banana: Could you say a bit more about the idea of metaphor? And furthermore, in a public talk you said that in your last show only a few of the paintings truly succeeded in this respect. How is one more successful than the other? Emma Biggs and Matthew Collings: We meant to say none of them succeeded as much as our highest ideal for our work demands. We’re always dissatisfied. For us, success is efficiency: order and surprise. Failure is chaos: too much surprise. Too much openness, with the formal enquiry we’re doing, ends up looking dull. We don’t think about metaphors, but we always observe the way light falls, how it defines what is seen, and we’re fascinated by the ways art finds to formalise this phenomenon, whether it’s a painting by Raphael or a sign on a piece of bark by an Aboriginal artist in Australia. Turps Banana: Do you think that all abstract paintings are metaphors? Is this inescapable or is it dependent on the artist’s intention, knowledge of painting and what it is doing? Emma Biggs and Matthew Collings: ‘Abstract’ is a misleading distinction. Certainly there’s a kind of art in which depiction doesn’t play a role, but depictive art is only ever really interesting because of its other dimensions beyond depiction. Turps Banana: Beauty/ugliness, darkness/light, symmetry/asymmetry, order/chaos, form and composition – all for me different sides of the same coin. If these notions or visual ideas are to do with aesthetics have they become lost as ways to discuss and evaluate the success of a painting? Emma Biggs and Matthew Collings: All these things are meaningful to us. Turps Banana: Is there always a narrative backdrop to your practice? Can we get some clues from your titles and is it important to know what they are? Why or, perhaps more importantly, how have you used stories from the Bible recently? Emma Biggs and Matthew Collings: We name all the paintings after words and phrases from the book of Genesis. We choose them so you can’t tell they’re biblical words. They are reminders to us about priorities, and they’re interchangeable. They’re about light, time, multiplicity, types of landscape, opposition between urban and rural, day and night, culture and uncultured, land and sea, plants, the earth, that kind of thing. We think of the religious origins of art. We like things that go back a long way. We like mosques and churches. We’re not at all religious, of course. We’re interested in the history of form. Turps Banana: Why is it important to keep looking back at the history of art and particularly the developments in religious painting as a key part of your practice? Lots of artists are preoccupied with coming up with something new, unique, original and of the future, and surely painting needs to be aware of its anachronism? Emma Biggs and Matthew Collings: We’re as interested in the new as anyone else, but we don’t focus on it exclusively, we’re interested in the old as well, even the timeless. Turps Banana: I’ve been reading about Michael Kidner and have just seen the recent show of his early 1960s paintings. 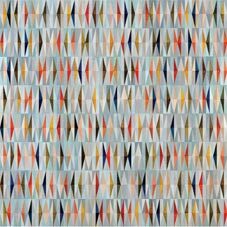 Mel Gooding writes about how he hated abstract paintings that, on the one hand, ‘encouraged a vaguely religious imprecision of feeling’, such as in the manner of Rothko, and on the other hand, paintings that merely stimulated and amazed the eye in a purely mechanical optical way. This chimed with the way I had been thinking about your paintings. Is it possible to clarify what it is you are aiming to stimulate in the viewer? Emma Biggs and Matthew Collings: One way you could see it, is to say that the critical proposals inherent in our paintings are to do with opposing irony. Irony has limitations; it can only go hand in hand with despair, and despair isn’t necessarily a good prompt for any kind of revolutionary motivation. Art that only reflects despair is a problem. Its jokes tend to be appreciated by those who already agree with them. Passivity isn’t really disturbed. But if our paintings avoid jokes they are not nostalgic for a form of artistic sincerity that is already well known. The viewer is confronted by configurations that appear to be constantly on the move. Perception is challenged. Passive consumption is resisted. Why do we run on to the battlefield of contemporary art, to impale ourselves on the bayonets of irony and despair, and exhibit our wounds? Because some battles are worth having. There has to be something better, something more transformative than obedient nihilistic knowingness. Be brave artist warriors—rise up and fight!